The sun was out, smiles were plenty, and high fives were easy to find. Costumes made a few appearances, parking was free, as were Gold Runner Coaster rides, and freshly baked cinnamon rolls were being handed out by chefs. The blue sky was brilliant, as was the unavoidable happy vibe. 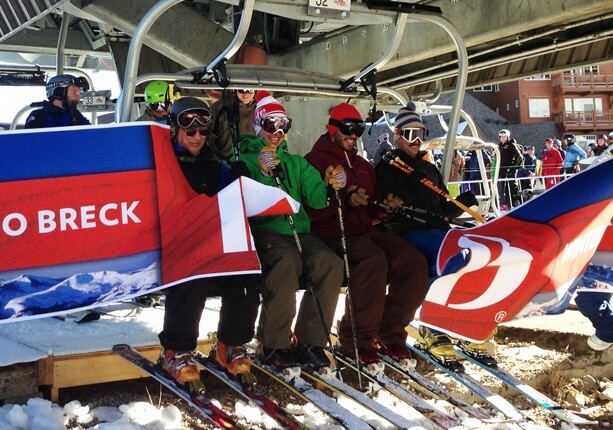 Yes, the 51st Breckenridge Opening Day had arrived. Four gentleman were the lucky few that were able to claim First Chair. Jeff Carlson and Chris Carlsted simply wanted to take a few laps before heading to work. “[We] just showed up an hour before the lifts opened,” said Carlson. Their motive for coming out on opening day? Excitement. Not a bad reason at all.Chris Young made a leap to get to Breck, quitting his job on the east coast just three weeks ago before heading out to the mountains of Colorado. Getting first chair is just that important. That first run must have been pretty darn fast. Ullr, the Norse God of Snow. 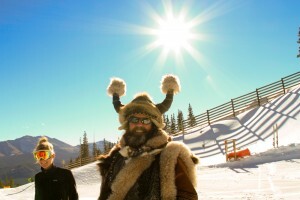 Ullr knows how to make us smile. That’s good to know, Mr. Ullr. Back in business. We’ll be sure to expect big things out of you this season! As the day was starting to show signs of winding down on the hill, the scene in the T-Bar was just warming up. Music was blasting the mood into full gear and drink specials were keeping folks happy while they watched the afternoon crowd take to the slopes. 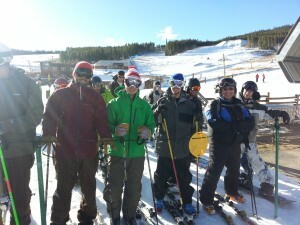 A beautiful day on the hill, indeed, and another wonderful opening day at Breckenridge. Looking forward to an awesome season! Keep that Out-Of-Office OFF, Ullr. We’re counting on you!